Alderwood Manor is a neighborhood of Bothell and Lynnwood with about 8,500 residents. Homes for sale in Alderwood Manor include newer single families in planned developments and some older homes. This area is popular with singles, couples, and families alike, many of whom own their own homes. Commuters will love that Alderwood Manor is adjacent to both I-5 and I-405; the drive to downtown Seattle is about 17 miles. From its position north of Lake Washington, Alderwood Manor also makes for an easy drive to Kirkland and Redmond or north to Everett. 3 Beds | 1 Baths | 1040 sq. Ft.
3 Beds | 1.75 Baths | 1224 sq. Ft.
3 Beds | 2.5 Baths | 2085 sq. Ft.
4 Beds | 3.25 Baths | 2672 sq. Ft.
5 Beds | 2.75 Baths | 2288 sq. Ft.
4 Beds | 2 Baths | 1946 sq. Ft.
5 Beds | 4 Baths | 5246 sq. Ft.
Blue Summit Realty has the most accurate and up to date Alderwood Manor real estate listings on the web. Currently there are 7 homes for sale, in Alderwood Manor. Of the 7 total Alderwood Manor residential listings for sale 0 are bank owned, 0 are short sales, 0 are new construction, and 0 are townhomes. The price ranges from $299,950 to $0 with a median list price of $550,492 and median sold price of $573,812. Make sure to refine your Alderwood Manor real estate search by property type, price, square footage, bedrooms, bathrooms and more with the search tool above or view the Alderwood Manor listings on our interactive map. 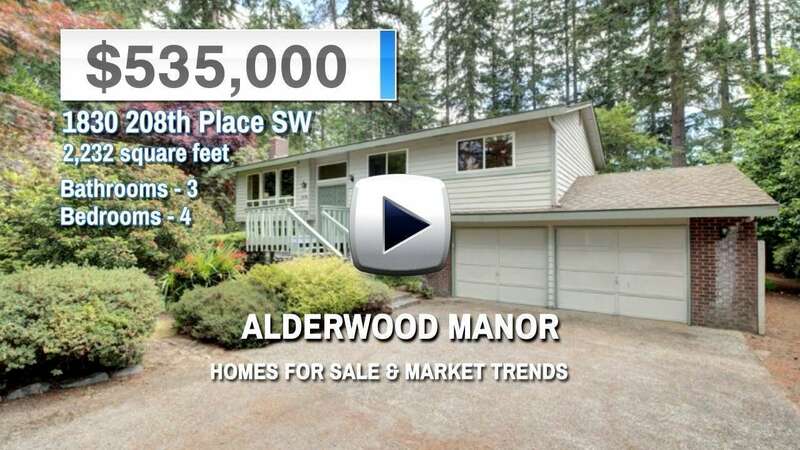 Our Alderwood Manor real estate listings were updated 8 minutes ago.